Primary polls can be erratic, so the rule is not to get too worked up about any one set of numbers. But now there have been five surveys conducted since Rick Perry announced his presidential campaign — one each from Gallup, Rasmussen Reports and Public Policy Polling, and two from YouGov. Each shows Mr. Perry having vaulted into a lead over Mitt Romney. On average, Mr. Perry gets 26 percent of the vote in the new surveys, as compared to 16 percent for Mr. Romney. By comparison, in polls conducted in the month prior to Mr. Perry’s announcement, he averaged 14 percent to Mr. Romney’s 21 percent. 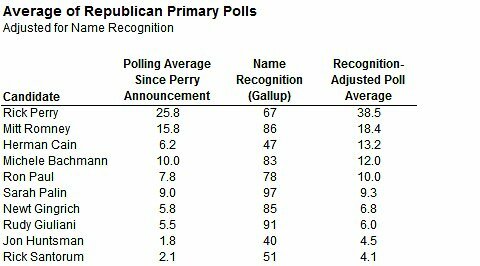 Mr. Perry’s results are yet more impressive if you account for his name recognition — which although increasing very rapidly remains behind that of Mr. Romney and some of the other Republican contenders. About two-thirds of Republican voters now recognize Mr. Perry’s name, which means that almost 4 in 10 who do recognize him have him as their first choice, roughly double the fraction for Mr. Romney. 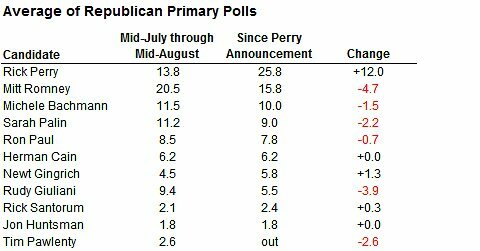 Mr. Perry also gains a bit if you exclude polls that list Sarah Palin and Rudy Giuliani as options, whose entry into the Republican race remains uncertain. In those surveys, Mr. Perry has almost 30 percent of the vote, ahead of Mr. Romney’s 18 percent. There are, to be sure, several reasons that Mr. Romney should not panic. First, with these shiny new numbers will come higher expectations for Mr. Perry, particularly during the three Republican debates that will be held in September. Second, Mr. Romney should have a fair amount of breathing room since the Republican field is heavily tilted toward very conservative candidates like Mr. Perry. Were Rudolph W. Giuliani or Chris Christie to enter the race, Mr. Romney might face a bit more pressure, as he would if Jon M. Huntsman Jr. were somehow to surge. Still, the conservative part of the Republican field is far more crowded, and will be even more so if Sarah Palin runs. Third, Republican elites have not given Mr. Perry a warm welcome. Of course, the same can be said for Mr. Romney; that Republicans have been casting about for a candidate like Paul Ryan or Mr. Christie reflects poorly on him as well as Mr. Perry. But as Barack Obama looks more and more vulnerable, Republicans may begin to prioritize electability over ideological purity. Finally, although national polls at this stage have a fair amount of predictive power, they are hardly foolproof. At this point in 2007, Rudy Giuliani had about 29 percent of the Republican vote, about where Mr. Perry is now. Instead, the key numbers for Mr. Romney are in New Hampshire and Iowa. Mr. Romney retains a reasonably large lead in New Hampshire for now. The danger is that, if Mr. Perry were to win Iowa convincingly, he could clear the field of other conservative candidates. New Hampshire has a lot of moderate and independent voters — but it is still majority conservative. And although Mr. Romney holds a solid lead over each of the individual conservatives, he does not hold a lead over them collectively: Mr. Perry, Michele Bachmann, Ron Paul, Herman Cain, Sarah Palin and Newt Gingrich together have in excess of 50 percent of the vote there, based on a trendline constructed from recent polls of the state, as compared to 34 percent for Mr. Romney. If, for example, Mr. Perry were to knock out Mrs. Bachmann, Mr. Gingrich and Mr. Cain by winning Iowa, picking up most of their votes, the New Hampshire contest would become very tight. Mr. Romney has adopted a slow-and-steady strategy since the beginning of the campaign, one which has de-emphasized Iowa. Instead, the idea would be to pick up delegates in the early going in friendly territory, particularly in caucus states where his organizational and monetary advantages should give him some help. Although the race might remain tight for the first month or two of the primary campaign, Mr. Romney would then hope to grab some big prizes once states started to vote on a winner-take-all basis in the spring, including large coastal states where Mr. Romney’s relative moderation could be an advantage. But the linchpin of that strategy has always been New Hampshire. If Mr. Romney does not win there, Republicans may decide that although Mr. Perry is not an optimal general election candidate, Mr. Romney has fallen too far behind him and it is best to rally around Mr. Perry rather than having a prolonged and bloody primary battle. There is also some chance that another moderate candidate who had performed relatively well in New Hampshire, like Mr. Huntsman or Mr. Giulaini, could lay claim to being the alternative to Mr. Perry. On a more fundamental level, the question would be how Mr. Romney could hope to beat Mr. Perry elsewhere on the map if he hadn’t beaten him in New Hampshire, which ought to be among Mr. Romney’s best states. These concerns would be less acute for Mr. Romney if a candidate like Mrs. Bachmann won Iowa. She has less of a national profile and her victory might be viewed as more of a one-off. Mr. Perry, for instance, could well survive a second or third place finish there, hoping to regroup in South Carolina or Florida. That means that Mrs. Bachmann and Mr. Perry would continue to split the conservative vote for some period of time, allowing Mr. Romney to clear his New Hampshire hurdle at a minimum. Unfortunately for Mr. Romney, Mr. Perry’s national surge does show some signs of transferring into Iowa. The only poll there since he officially entered the race shows him ahead of Mrs. Bachmann, with 21 percent of the vote to her 15 percent, with Mr. Romney stuck in between at 18 percent. The question for Mr. Romney is whether his New Hampshire lead is robust enough to survive a win by Mr. Perry in Iowa. If not, Mr. Romney will need to involve himself more in Iowa — whether he’s playing to win the state or simply to meddle in it, hoping somehow to harm Mr. Perry at the expense of Mrs. Bachmann and other candidates that would be less of a threat to him. Mr. Romney does not need to make this decision today: it’s probably worth waiting to see how Mr. Perry performs in the debates, as well as whether Ms. Palin enters. For the time being, it may be more important for Mr. Romney to focus on cultivating elite opinion, and raising money for a strategy that might require the primaries to continue until late into the spring. Still, Mr. Romney probably will need to decide upon a strategy reasonably soon, either committing to Iowa or writing it off. Hedging his bets could be the worst alternative.